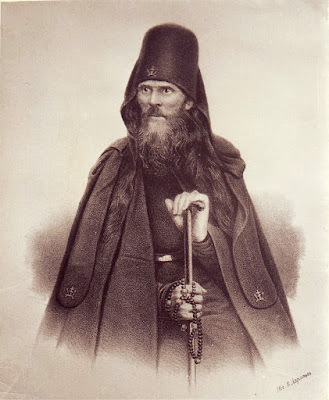 Venerable Parthenius, in the world known as Peter Ivanovich Krasnopevtsev, was born on 24 August 1792 to a poor family and was accustomed to hardships since childhood, since from a young age he had to work hard. His older brother Basil was a monk. At a young age Peter had a vision of the Holy Spirit in the form of a snow-white dove soaring in the sky. This vision made the thirst for something better to sink into his soul and he became opposed to all earthly things for himself. He studied at the Tula Seminary, but did not complete his studies. Instead, he went to the Kiev Caves Lavra. For twelve years he had the obedience of being the prosphoron maker of the monastery. In imitation of Saint Nicodemus the Prophoron-Maker of the Kiev Caves, he also memorized the entire Psalter. In 1824 he was tonsured a monk, and in 1834 he was appointed confessor of the monastery. In 1838 Saint Philaret tonsured him into the schema, and he took the name Parthenius after Saint Parthenios of Lampsakos. His prayer rule consisted of reading one Gospel every morning, noon and evening, singing the entire Psalter daily, morning and evening prayers, an Akathist to the Savior and to the Theotokos, venerating the Passion of Christ, and reciting the "Theotokos and Virgin, Rejoice" 300 times a day. All his contemporaries noted that Parthenius did not cause feelings of envy, on the contrary, everyone loved him. His path of spiritual exploits passed (in his own words) very calmly, without much struggle. He even worried that he was not persecuted because he said that "the Saints are accomplished in sorrows." He reposed on 25 March 1855. In 1994 he was canonized by the Ukrainian Orthodox Church (Moscow Patriarchate). O Lord Jesus Christ, Son of God, do not permit vanity, self-love, sensuality, carelessness, anger, to rule over me and steal me from Thy love. O my Lord, my Creator, all my hope! Do not leave me without a portion in the blessed eternity; grant that I too may follow Thy holy example, that I may submit to the authorities placed over me; grant me the clean soul, the simplicity of heart, which make us worthy of Thy love. To Thee, my God, I lift up my soul and my heart; do not allow Thy creation to perish, but free me from the single and greatest evil – sin. Grant, Lord, that I may endure anxiety and sorrows of the soul which the same patience as the joy with which I receive satisfaction of the heart. If Thou desirest, Lord, Thou canst cleanse and sanctify me. Here, I commit myself to Thy mercy, begging to destroy in me all that is offensive to Thee, and to unite me to the assembly of Thy chosen. O Lord, take from me idleness of spirit, which destroys time; vanity of thoughts, which hinders Thy presence and distracts my attention in prayer; if, while in prayer, I turn away from Thee in my thoughts, help me, so that this distraction may not be willful, and that averting my mind, I may not avert my heart from Thee. I confess to Thee, my Lord God, all the sins of my wickedness, committed before Thee, now and in the past; forgive me for them, for the sake of Thy holy name, and save my soul, which Thou hast redeemed with Thy precious Blood. I entrust myself to Thy mercy; I submit to Thy will; do with me according to Thy mercy, and not according to my evil and wickedness; teach me, Lord, to dispose my deeds so that they will serve in glorifying Thy holy name. Take pity, O Lord, on all Christians, hear the wants of all who cry out to Thee; deliver from all evil; save Thy servants (names); send them comfort, consolation in sorrows, and Thy holy mercy. Lord, I pray to Thee especially in sorrows, and Thy holy mercy. Lord, I pray to Thee especially for those who have in any way insulted, abused, and grieved me; do not punish them for the sake of me, a sinner, but pour Thy mercy upon them. O Lord! I pray to Thee for all those whom I, a sinner, insulted, or tempted, in word, deed, thought, knowingly and unknowingly. Lord God! Forgive us our sins and mutual offenses; dispel, Lord, from our hearts all indignation, suspicion, anger, remembrance of evil, quarrels, and all that might hinder and lessen brotherly love. Be merciful, Lord, to those who have entrusted me, an unworthy sinner, to pray for them. Be merciful, Lord, to all who ask Thy help. Lord! Make this day a day of Thy mercy; give to each according to his petition; be the shepherd for the lost, the guide and light of unbelievers, the teacher of the unwise, the father of orphans, the helper of the oppressed, the healer of the sick, the comforter of the dying, and lead us all to the desired end, to Thee, our refuge and blessed repose. Amen.